Every time I make any form of Ravioli it's always a struggle to find a reason to use the leftover ricotta cheese. I know I can make pancakes or stuffed shells or plenty of other things, but it's still difficult before the ricotta cheese goes bad. I ended up making this stuffed chicken breast the last time I made ravioli and it did not disappoint. It was deliciously cheesy, easy and cooked through quickly. It was perfect with some pasta for an easy weeknight dinner. Sautee a little garlic in olive oil, then wilt the spinach until just cooked. Let cool and squeeze out as much excess liquid as possible. Roast the red bell pepper over a grill or burner to char the skin until black. Let cool and peel off blackened skin. Remove seeds and ribs and dice small. Mix spinach and red pepper with cheeses, herbs, spices, salt and pepper. Adjust to taste, adding more cheese as necessary. 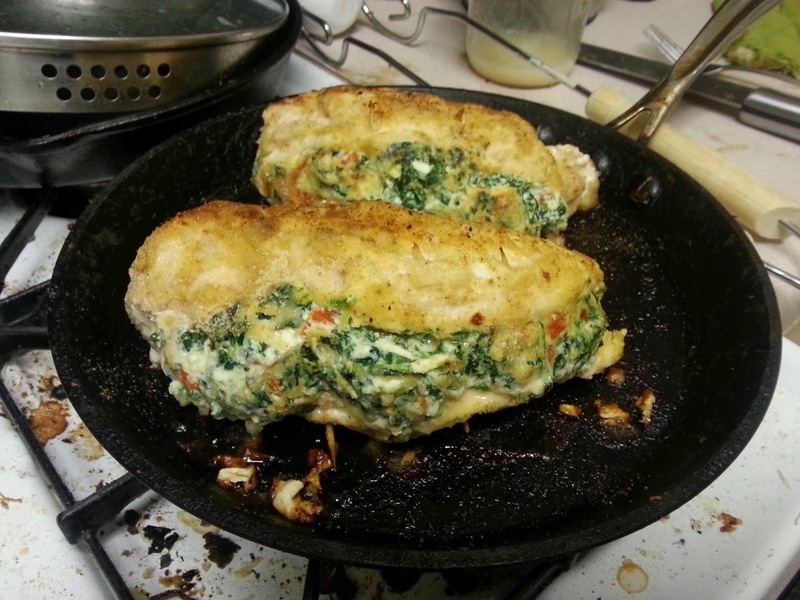 Butterfly chicken breasts by cutting a slit down the side and opening up a pocket. Fill the pocket with cheese mixture and pin closed as best as possible with toothpicks of cocktail skewers. Bread the chicken in flour, egg and breadcrumbs. Finish chicken in the oven for 10 more minutes or until cooked through. Let cool a couple minutes before serving. Note: if you have extra filling, you can make more chicken, save it for pasta or use it as a warm dip/topping for french bread. Don't really worry about making too much.